Making a 7-minute movie in a 48 hour film festival – as camera person, gorilla, director and editor. All these projects were shared with good friends – I am lucky to know so many crazy-creative and lovely people. At the ‘Art by Funny People’ exhibition, at Thistle Hall, I especially enjoyed encouraging people to try on my masks (which were exhibited with a “please touch” notice). A mask on a wall is, at best, only a half-finished artwork. I am always fascinated by the way the same mask looks weirdly different on different people. Young blokes were particularly drawn to the newest mask, a very heavily bearded man, but keeness to try on a different gender was another characteristic quirk of interaction with the masks. During the show another masked character (persona? entity? ), Toothfish, visited the gallery and viewed the masks. 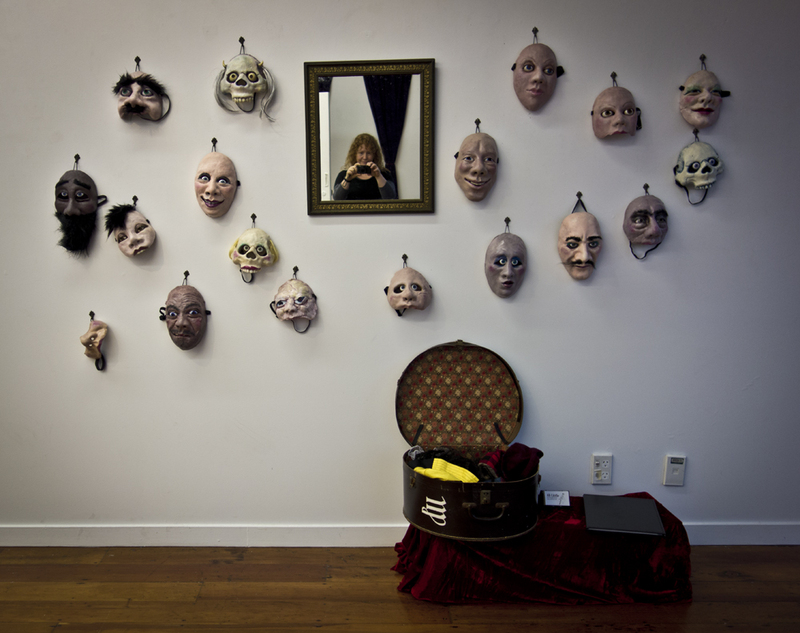 A reviewer visited too, commenting that “Ali Little’s masks have a distinct palette and style, and a pleasing interactive display. They ask to be used. ” My first art review! 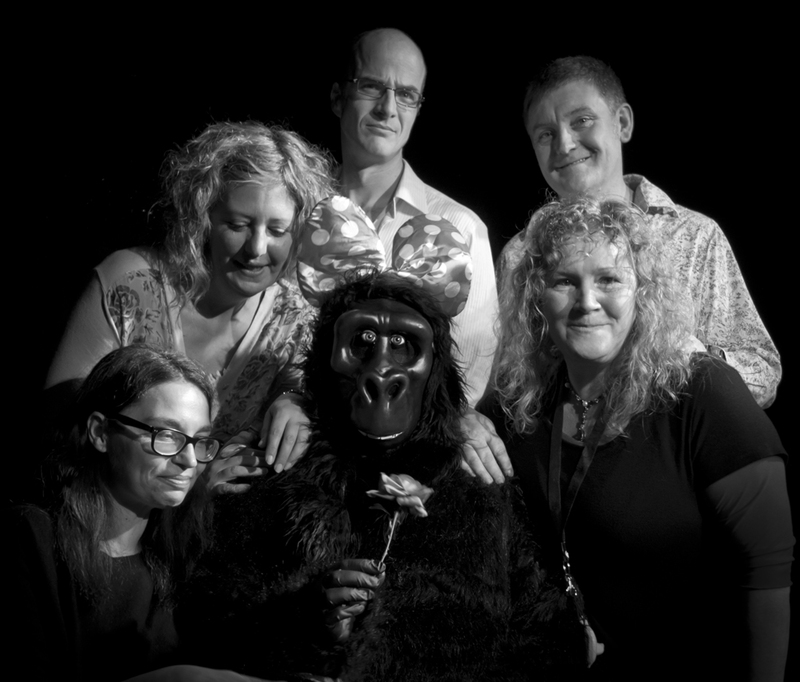 The Comedy Festival show All-Star Gorilla was a revival of the traditional Keith Johnstone format – one that the Wellington Improvisation Troupe hold the local licence for, deliberately going back to doing the show by the book. We had a lot of fun directing each other in favourite games, and taking turns being the eponymous gorilla. Meeting the public in costume when handing out flyers to promote the show, was an interesting experience. Instead of the usual eyes-slide-past reaction, when maybe one in ten people will take a flyer, people actively approached Dru, boldly or shyly, to take flyers and pose for photographs. For the 48 Hour Film festival my group, average age mid forties, all complete neophytes, were competing with experienced school, university and professional film making teams. We have absolutely no skills in script writing, using a video camera or editing, but we had fun making it all up. At 7pm on Friday night all the teams were given compulsory elements that had to be included, a genre (for us, Action/Adventure), and then set loose to make a film, to be delivered before 7pm on Sunday. It was tough, working out a general plan Friday night, filming most of Saturday, and editing Saturday night through most of Sunday. We completed ours on time, one of 228 groups in our city, and 800 teams nation wide. I’m looking forward to seeing ‘The Heart of Bwiindi” up on the big screen at the heats. I am both entirely confident and completely comfortable that we aren’t in the running for any prizes or general acclaim, the important thing really was taking part. And hey, I got to get the gorilla out of her suitcase again. This entry was posted in improv, masks and tagged 48hours, exhibition, film, gorilla, improv, improvisation. Bookmark the permalink.